This article is copyright © 2009 Centre for Editorial and Intertextual Research, and is the result of the independent labour of the scholar or scholars credited with authorship. The material contained in this document may be freely distributed, as long as the origin of information used has been properly credited in the appropriate manner (e.g. through bibliographic citation, etc.). The matter contained within this article provides bibliographical information based on independent personal research by the contributor, and as such has not been subject to the peer-review process. D. SHELTON. ‘Sir Anthony Carlisle and Mrs Carver’, Romantic Textualities: Literature and Print Culture, 1780–1840, 19 (Winter 2009). In his youth, Carlisle believed he was descended from a Lord Carlyle who lost his estates and title in the seventeenth century, the estates being traceable back to Robert de Brus, Lord Annandale. The family was not wealthy and Carlisle was assisted by his half-brother Nicholas when he was appointed surgeon to Westminster Hospital in 1793. The position was voluntary and time spent on his own comparative anatomy experiments was unpaid, so it was necessary for Carlisle and similar young surgeons to find paying work, in order to fund living expenses and experiments while they built up a successful surgical practice. Money was evidently an issue for him, even with assistance from his brother. At the time, Carlisle was friendly with a number of literary figures including Robert Southey, William Godwin, and Thomas Holcroft, and was inspired by their writing: recent research has uncovered the probability that Carlisle was the author of a number of gothic novels, at least until his marriage in 1800. He was, in effect, a man with a literary secret that has appeared from the depths of anonymity, over two hundred years since its concealment. However, Carlisle did leave one visual clue, his miniature portrait by Henry Bone RA, contains two inkwells, a possible sign that he had published under two different identities. Carlisle’s literary works are an ongoing research project of the present author, but the key to unlocking his literary efforts lies in The Horrors of Oakendale Abbey by ‘Mrs Carver’, a name generally accepted by scholars as a nom de plume. My initial encounter with Oakendale Abbey was the result of pure serendipity (coincidentally, a word coined by Horace Walpole, a distant cousin of Carlisle’s wife)—the novel appearing in an online search for ‘resurrection men’. Examination of a recent edition of Oakendale Abbey, published by Zittaw Press in 2006,  made readily apparent that the author was familiar with the subject of the resurrectionists:‘Resurrection men, who brought numbers of bodies to Oakendale Abbey. They were generally received in the night; and the person who was a chief superintendent, and who paid the man who procured the bodies’ (p. 179). The author evidently knew the subject well, as the position of Superintendent existed in anatomy schools, not at private houses such as Oakendale Abbey. The novel can thus be seen as a rare and knowledgeable eighteenth-century reference to the subject of body snatching. Gradually, coincidences of places and people emerged in the novel, suggesting connections to Carlisle, his family, and the broader history of the Carlyles. The first instance appears in a reference to Milford Haven in Wales, close to where Carlisle’s future father-in-law John Symmons FRS (1745–1831), elder brother of Revd Charles Symmons, had a country estate at Slebech Hall. The heroine, Laura, comments: ‘We landed in Milford Haven, at a place which appeared almost uninhabited; and consisted only of an inn and a few houses’ (p. 99)—this, when taken with the reference to resurrection men, seemed to me an intriguing coincidence. Then, as with a cryptic crossword puzzle, more and more clues were solved, building an ever-stronger conviction that Anthony Carlisle was in fact ‘Mrs Carver’, and so the real author of Oakendale Abbey. He seems to have been fascinated by the histories of the Symmons and Philipps families (John Symmons’ mother being a Philipps), which included the ennobling of Sir Richard Philipps as Lord Milford on 13 July 1776, as well as by their two mansions at Slebech Hall and Picton Castle, both near Haverfordwest and Milford Haven in the Welsh county of Pembrokeshire. The publisher of Oakendale Abbey was William Lane of Minerva Press in Leadenhall Street, who solely, or jointly with other publishers, published numerous gothic novels and other fashionable potboilers between 1794 and 1808, mostly by authors who have since been identified, but also some fifty novels by novelists who remain anonymous. Oakendale Abbey was first published anonymously in 1797, but later lists record the author as the pseudonymous Mrs Carver. That Carlisle’s relationship to Oakendale Abbey was built from the bottom-up lies in the fact that almost the last link to be discovered was the late realisation that the name ‘Mrs Carver’ can be inferred as both a wordplay on ‘Mr Car[lisle]’ and on his occupation as a surgeon, ‘a carver’ of meat. It is likely Mrs Carver was coined as a private joke as Carlisle was fond of wordplays. Given the nature of Mrs Carver’s novels, one can understand why Carlisle might have wished to conceal his identity: such hack authorship would certainly have had an adverse impact on his career, especially after his election to the position of Surgeon at Westminster Hospital. 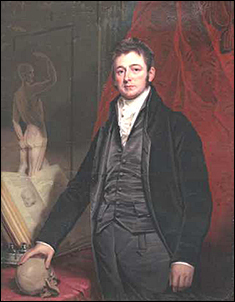 Carlisle married in 1800, was elected as a Fellow of the Royal Society in 1804, and several years later in 1808 was appointed Professor of Anatomy at the Royal Academy. It would have become increasingly harder for him to consider revealing his authorship, especially as the flawed main character in Oakendale Abbey was based upon his father-in-law. the date and location of publishing. The number of educated men in London in 1797 capable of fitting any four of the above seven criteria could be counted on no more than the fingers on one hand. Carlisle appears as the only person whose knowledge meets all seven categories, as well as being plausibly linked to the pen-name of Mrs Carver. Alternative possibilities considered as Mrs Carver included Anthony’s younger brother, Nicholas Carlisle: Against him is that he was not a surgeon; he was unlikely to have visited the Symmons and Philipps in Wales; and he was travelling as a purser on multiple trading voyages to the East Indies when the Carver novels were published. It is very unlikely he had sufficient knowledge of John Symmons, medical matters, and the resurrectionists. Discounted possibilities as author also include Carlisle’s future wife Martha Symmons. The main reason for discounting her is owing to matters of delicacy—namely that Lord Oakendale, despite being married, has predatory designs on the heroine Laura (Oakendale Abbey, pp. 103, 138), wishing to marry her, until late in the novel when he discovers she is his niece: ‘his pride exulted in calling that woman a niece, whom he had a short time before designed and solicited for prostitution’ (p. 143). It is improbable that Martha would have created a figure based on her own father in such a negative manner. Other faint possibilities include Carlisle’s literary friends, such as Godwin, but it is highly unlikely that any of them had the need to remain anonymous or the collective knowledge displayed in Oakendale Abbey, which seems so peculiar to Carlisle himself. Making sense of the links between Carlisle and Oakendale Abbey is difficult for anyone who has not read the novel, but an attempt needs to be made. The underlying location within Oakendale Abbey is a remote mansion in Cumberland, near Carlisle, owned but not visited by Lord Oakendale, where, unknown to him, dead bodies collected by resurrection men from the local area are received and dissected (p. 179). As noted earlier, Oakendale has designs on Laura, a young woman whom he meets but later discovers is his niece. The novel is set in the eighteenth century and Carlisle portrays himself in the novel as Eugene, a figure from an apparently modest background, who emerges as Lord Vincent, with titles, wealth, and power, eventually winning the hand of Laura. A full examination suggests that the book emerges from a personal fantasy, based upon Carlisle restoring the titles and fortune lost by Lord Carlyle. Several names connected to the Carlyle family history surface in Oakendale Abbey. The main character is variously described as Lord Oakendale, Thornaby, and Robert Carleton—thus his title is Robert, Lord Oakendale, with Oakendale Abbey itself described as an empty family pile in Cumberland (p. 25). A strong possibility emerged that ‘Oakendale’ might be a word play on ‘Annandale’, a district in Scotland adjoining Cumberland near Carlisle. The choice of Oakendale as a wordplay to represent Annandale seems an easy progression. The main male character Robert, Lord Oakendale corresponds to Robert, Lord Annandale. Annandale, Thornaby, and Carleton are all names which appear in the Lord Carlyle and De Brus history. In addition, Thornaby and Carlton are the names of two villages close to Stillington in County Durham, Carlisle’s birthplace. 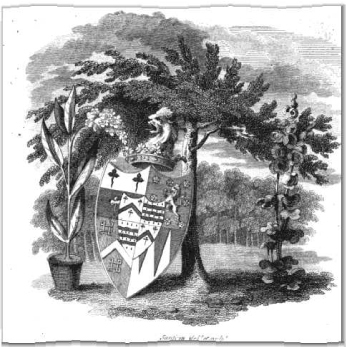 Within Oakendale Abbey, there are a number of other links to Anthony Carlisle. For example, it becomes apparent that although the name ‘Lord Oakendale’ comes from the Carlyle family history, as noted earlier, his character is mainly based upon John Symmons FRS, father-in-law of Carlisle. Symmons lived in London, but had a country home at Slebech near Haverfordwest and Milford Haven in Wales, as well as another ancient, and empty, Symmons family mansion some fifteen miles north of Haverfordwest at Llanstinan. Previous Symmons’ mansions are referred to in several reference works: One such example occurs in a book written by Anthony Carlisle’s younger brother, Nicholas, entitled A Topographical Dictionary of Wales, a Continuation of the Topography of the United Kingdom of Great Britain and Ireland of 1811. When describing Llan Stinan [sic], Nicholas notes that ‘[t]he ancient and hospitable Mansion of the Family of Symmons is now rapidly falling to decay’. In the same book, when describing Little Newcastle, which is about two miles south-east of Llanstinan, Nicholas observes: ‘Here is the site of Martel, the ancient residence of the family of Symmons before they removed to Llanstinan’. Samuel Lewis, a later nineteenth-century commentator on Llanstinan comments: ‘there was the ancient mansion of the family of Symmons […] The turnpike road from Haverfordwest to Fishguard passes through the parish’. Thus, during the late eighteenth century, while the Symmons’ home remained in existence at Llanstinan, about ten miles north of Slebech Hall and fifteen miles from Milford Haven, it was nevertheless vacant and unoccupied. In Oakendale Abbey, the vacant Symmons mansion is renamed Oakendale Abbey and ‘transported’ to near Annandale, north of the city of Carlisle, Cumberland. From 1783, John Symmons was one of the twenty-five members of the Noblemen and Gentleman’s Catch Club, along with the Earl of Sandwich and the Earl of March, both noted for their debauchery. The Prince of Wales became a member in 1786, as did the other Royal Dukes between 1787 and 1807. The name Westhaven would appear to be wordplay on the town of Haverfordwest and its harbour of Milford Haven. Haverfordwest itself, and the estates of both the Symmons and Philipps families all adjoin Milford Haven, with Haverfordwest being within five miles of Picton Castle and Slebech Hall. In focusing on Milford Haven and Haverfordwest, Carlisle has punningly combined both ‘haven’ and ‘west’ to create Westhaven: Carlisle probably avoided using the name Milford, as the real owner of Picton Castle was Lord Milford and the associations would have been too transparent. Continuing the wordplay, he is thus left with ‘Haverford’: again, this is too obvious to use and after another word play—instead we find that the daughter of Lord Westhaven is Miss Rainsford, which carries echoes of Haverford. The connections extend beyond the aristocratic protagonists of the novel: the faithful servant of Lady Oakendale is named Marcel, only one letter different from the ‘Martel’ mentioned above—the estate which the Symmons family occupied prior to moving to Llanstinan (p. 134). The content of Oakendale Abbey includes a number of medical references and descriptions that demonstrate the author’s medical knowledge—for instance, accoucheur, a French word used in medical circles as an alternative to ‘midwife’ or ‘man-midwife’ (p. 122). As noted earlier, the novel includes references to anatomists and resurrectionists (or body-snatchers), with whose activities the novel’s author appears familiar: ‘The dead body of a woman hung against the wall opposite to the door she had entered, with a coarse cloth pinned over all but the face; the ghastly and putrefied appearance of which bespoke her to have been sometime dead’ (p. 73). Only someone familiar with anatomical practice would have known that bodies were stored hanging vertically, rather laying flat: ‘those unfeeling monsters of society, who make a practice of stealing our friends, and relations from the peaceful grave where their ashes, as we suppose, are deposited in rest’ (pp. 157–99). Although Laura faints and falls into the hands of the anatomists, they do not harm her, but carry her still unconscious to a cottage and leave her safe there (p. 75). At one point, amidst some dead bodies Laura is rescued by a kind surgeon with the name Du Fresne (pp. 86–92), who also tends two wounded duellists, as surgeons were called upon to do at the time (p. 93). The surgeon and anatomists are all kind to Laura, possibly reflecting Carlisle’s chivalric attitude towards the heroine. The circumstantial and textual evidence linking Oakendale Abbey to Carlisle and Symmons is so compelling, that there is no other real candidate as author. If the evidence identifying Carlisle as the author of Oakendale Abbey can be accepted, the other novels attributed to Mrs Carver can be reviewed for evidence supporting Carlisle as author, but with a base case established via Oakendale Abbey they do not require such a high burden of proof. Space permits only a brief discussion of one other: The Old Woman. Its publication was announced on 5 June 1800 in the Star newspaper and on 17 June 1800 in the Morning Chronicle. The Old Woman contains more plays on names and medical references that support a link to Carlisle. Unlike the gothic-tinged Oakendale Abbey, The Old Woman is an epistolary novel, consisting ofa long series of letters between the characters without intervening dialogue or text. Towards the end of the novel, it is revealed that the main location within the story, Arkley Castle, is reached from Ireland via Milford Haven (II, letter 2), a location which appears in Oakendale Abbey. Arkley Castle might then represent Picton Castle, the ancestral home of the Philipps family, close to Milford Haven and only a mile from Slebech Hall owned by John Symmons. At the time The Old Woman was published in 1800, the head of the Philipps family was Lord Milford, formerly Sir Richard Philipps, 7th Bart., and nephew of Bulkeley Philipps, whose grand-daughter Mary Philippa Artemisia Grant eventually inherited Picton Castle. Lord Milford was raised to the peerage in 1776, as a peer of Ireland, despite the Philipps family having no estates in Ireland, with his choice of Milford relating to the nearby Milford Haven. Even so, the Irish peerage might explain why some of The Old Woman novel is set in Ireland. The choice of names of two other characters The Old Woman appear as plays on the names of close friends of Carlisle. Mr Goodworth, a clergyman, for the author William Godwin, husband of the author Mary Wollstonecraft and father of Mary Shelley, who trained as a clergyman before he became a writer. The other character Elinor Safforey, might be seen as a distortion of Edith Southey, wife of Robert Southey. Both characters appear within the first two paragraphs of the novel. I took some slight refreshment, and endeavoured to collect my spirits in order to encounter the sad scene in which I had engaged, and to inspect, as far as circumstances would admit, the body of our unfortunate friend, both for my own satisfaction as well as yours. According to my directions, Lucy had ordered the coffin to be so slightly screwed, that the lid was easily again taken off.— There is a something in the contemplation of a dead body, even under the most uninteresting circumstances, which is awful in the extreme. I confess, when I entered the room, I shuddered, not with horror or fear, but an indescribable sensation seemed to overpower me, and it was some moments before I could recover myself sufficiently to approach the coffin, and when I beheld the mangled features of our dear departed Julia, I could not avoid uttering a shriek of terror. Lucy supported and encouraged me to examine the features of her beloved mistress; the frequent sight having rendered her less shocked at the contemplation of an object so dreadful. The body was dressed exactly as it was found in the water, that is, the remains of the dress, for it was partly torn to pieces, and the face so entirely mutilated, that it must be impossible to ascertain from that whether or not it was really Julia. The size and shape corresponded with her’s, and the hair is the same colour, but upon examining the hands, I think they appeared larger, and not so beautifully formed as were Julia’s; but this might be accounted for by having been so long under the water, and being swoln. Her stockings and the remains of her linen were marked J.S. and Lucy says, she could swear to the work being her’s. The gown was the very one in which she had dressed her on the day she was missing. These are proofs strong enough of the body’s being no other than that of our unhappy friend, even were any wanting; but the letters, the rings, and the smelling-bottle, which is now sent, and was a present from myself to her, with the initials of my own name upon it, are all such convincing testimonies, as to require no other; and as to the face, as I said before, it is so entirely mutilated, that no trace of feature or countenance could possibly be discovered. After I had contemplated the body, heard, and joined in the lamentations of Lucy, and breathed a most humble and devout wish for her eternal happiness, I ordered the coffin to be screwed down, and attended by all the servants, who were, I believe, real mourners, we proceeded to the parish-church, which is very near the castle, and there in the vault of her ancestors were deposited the sad remains of Julia St. Edward […] Why then should we lament? ’Tis true, the circumstances of her death were shocking, and it was impossible to behold her disfigured corpse without terror; but the ultimate event to her is the same as if she had been surrounded by pitying friends and weeping kindred. Taken together, the references from the novels allow a confident attribution of The Horrors of Oakendale Abbey and The Old Woman to Carlisle. The case of Oakendale Abbey offers a persuasive example of how it may be possible to determine the author of an anonymous gothic novel by reviewing for specialist technical knowledge or by sifting through facts connected to real places or people. In this example, the accumulation of material became so overwhelming, that the case was provable in the same way as a murder without a body may be provable with enough circumstantial evidence. No reference has yet been found to Carlisle as an author in the correspondence of his friends; however, there is evidence of the influence of Carlisle appearing in the novel The Adventures of Hugh Trevor (1794–97) by Thomas Holcroft and in the poem ‘The Surgeon’s Warning’ (1796) by Robert Southey. In addition, a separate line of research traces the influence of Carlisle on another anatomical gothic masterpiece—Mary Shelley’s Frankenstein (1818). Carlisle’s role in the work of Southey and Holcroft, and the reasons for regarding him as an influence on Frankenstein, are explored in depth in the first full biography of Carlisle, written by the present author: The Real Mr Frankenstein: Sir Anthony Carlisle and the Social Genesis of ‘Frankenstein’. This paper is condensed from research into Anthony Carlisle, which is to be published and is available as a full eBook biography, as of October 2009. More details regarding this work can be found at <http://therealmrfrankenstein.blogspot.com>. The author is very grateful for helpful comments received from Peter Garside in the preparation of this extract. 1. Mrs Carver, Mrs, The Horrors of Oakendale Abbey (London: Minerva, 1797; rptd Zittaw Press, 2006). 2. See The English Novel, 1770–1829: A Bibliographical Survey of Prose Fiction Published in the British Isles, 2 vols (Oxford: OUP, 2000), item 1797: 33. 3. Thanks for supporting evidence are due to Serena Potter, Zittaw Press, and Curt Herr, who wrote the introduction to the Zittaw edition of Oakendale Abbey. 4. Mrs Carver, The Horrors of Oakendale Abbey (London: Minerva Press, 1797; rptd Zittaw Press, 2006). Subsequent references are to the Zittaw edition. 5. According to Dorothy Blakey, ‘Mrs Carver’ is listed as the author of Oakendale Abbey in the Minerva Library Catalogue for 1814—see The Minerva Press, 1790–1820 (London: British Library, 1939), p. 181: Appendix I: 1797. 6. ‘Mrs Carver’, CW3: Corvey Women Writers on the Web. Online: Internet (Apr 2009): <http://www2.shu.ac.uk/corvey/CW3/AuthorPage.cfm?Author=MC2>. 7. The Cavern of Death (1794), Open Library. Online: Internet (Apr 2009): <http://openlibrary.org/b/OL13377163M/The-Cavern-of-Death>. 8. The Cavern of Death (London: James Bell, 1794; rptd Chicago: Valancourt, 2005). 9. The Animated Skeleton (London: Minerva Press, 1798; rptd Seattle: Valancourt, 2005). 10. Mrs Carver, The Old Woman, 2 vols (London: Minerva Press, 1800). Rptd in the Chawton House Library: Novels Online portal. Online: Internet (Apr 2009): <http://www.chawtonhouse.org/library/novels/carver_old.html> (I, Letter 9). Subsequent references are to the Chawton edition. 11. See Ruth Margaret Blakely, The Brus Family in England and Scotland, 1100–1295 (Woodbridge and New York: Boydell Press, 2005), for further information on Thornaby (p. 189) and Carlton (pp. 16, 191). 12. Nicholas Carlisle, A Topographical Dictionary of the Dominion of Wales (London, Bulmer, 1811), [n.p.]. 14. Samuel Lewis, A Topographical Dictionary of Wales (London: S. Lewis, 1845), p. 105. 15. See the entry for ‘Symmons, Charles (1749–1826), poet and biographer’, in Oxford Dictionary of National Biography (2004– ). Online: Internet (Aug 2009): <http://www.oxforddnb.com/view/article/26884/26885?back=,26884>. 16. Viscount Gladstone, Guy Boas, and Harald Christopherson, Noblemen’s and Gentleman’s Catch Club: Three Essays Towards History (London: Cypher Press, 1996), p. 109. 17. Charles Hardy, Register of Ships, Employed in the Service of the Honourable the United East India Company, from the Year 1760 to 1810 (London: Heseltine, 1811), p. 166. 18. Sir Evan Davies Jones and Herbert Millingchamp Vaughan, The Welsh Book-Plates in the Collection of Sir Evan Davies Jones, Bart., M.P. of Pentower, Fishguard. A Catalogue, with Biographical and Descriptive Notes (London: A. L. Humphreys, 1920). 20. Manasseh Dawes, Miscellanies in Prose and Verse on Various Occasions (London: For the Author, 1776). 21. Caroline Symmons and Charles Symmons, Poems (London: Joseph Johnson & Co., 1812). 22. Charles Bernard Gibson, The History of the County and City of Cork, 2 vols (London: T. C. Newby, 1861), II, 204. 23. See the Picton Castle website for images: <http://www.pictoncastle.co.uk>. 24. Arthur Murphy, The Way to Keep Him: A Comedy (London: John Bell, 1792), Act II, Scene I (p. 62); collected in vol. 17 of Bell’s British Theatre. Consisting of the Most Esteemed English Plays, 34 vols (London: Cawthorn, 1791–99). 25. J. C. Lavater, Essays on Physiognomy, translated by Thomas Holcroft, 3 vols (London: Robinson, 1789). 26. Robert Southey to Joseph Cottle, 26 Apr 1797; in Linda Pratt (ed. ), The Collected Letters of Robert Southey: Part One: 1791–1797. Online: Internet (May 2009): <http://www.rc.umd.edu/editions/southey_letters/Part_One/HTML/letterEEd.26.212.html>. Southey also made several direct references to Lavater in his letters between 1793 and 1797. 27. Charles Symmons (ed. ), The Prose Works of John Milton; with a Life of the Author, Interspersed with Translations and Critical Remarks, 7 vols (London: Joseph Johnson, 1806).